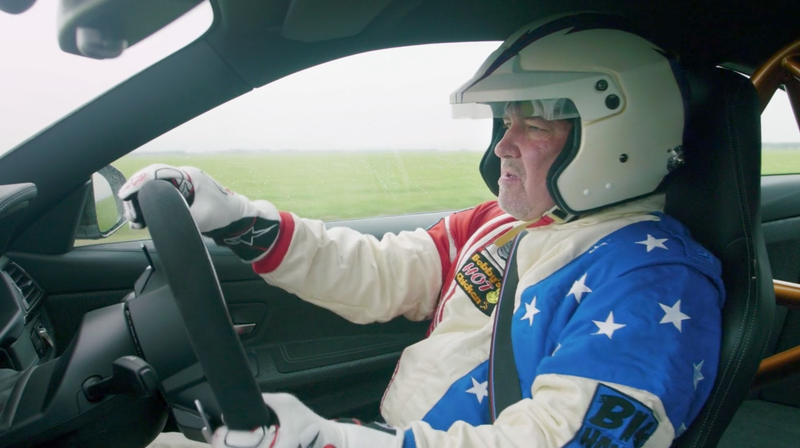 Viewers of the inaugural season of The Grand Tour will remember the show’s own version of The Stig as NASCAR driver Mike Skinner: The American. But it seems like for the upcoming second season of the show, Skinner is out. I’m speculating a bit here, but as the new season is set to air on Dec. 8 and Skinner is tweeting about it one month before it does, it could mean that he was either dropped at the last minute or he wasn’t allowed to publicly announce it until now. Either way, we won’t be seeing the spangly American on the show come winter. I have mixed feelings about this. On one hand, it was rather nice to see an American on a show that stars extremely British hosts, kind of like the flavor that Matt LeBlanc brings to Top Gear now. On the other, I wasn’t thrilled with how Skinner’s character was portrayed. His hatred of import cars and undying love for fat-displacement V8s felt very heavy-handed and stereotypical. Perhaps this was funny for a non-American audience, but for me it felt tired and stale. Like, “Oh, look, here’s a twangy American NASCAR driver and he doesn’t even know what BMW stands for.” Low-hanging fruit, guys. Anyway, I’m interested in seeing how the team will now cover the lap times portion of the show now, if they decide to keep that segment.